Amazon.com continues to maintain a solid growth trajectory, but there are challenges to maintaining this growth over the long term. Amazon.com (NASDAQ:AMZN) has plenty of opportunity to continue growing revenue at double-digit rates for the foreseeable future. However, it is important to acknowledge the significant challenges that exist in Amazon.com's pursuit of further market share gains from established retailers such as Wal-Mart (NYSE:WMT) and Target (NYSE:TGT). Profitability pressures have forced Amazon.com to consider price increase to its wildly popular Prime service, and this could be the first of many challenges facing the company in the near future. Amazon.com has a great track record of innovating and reshaping the consumer experience. While the company has used this success to deliver tremendous revenue growth, it is unlikely that every venture will be a success. While it is a distant memory, Pets.com was an Amazon.com-backed company that is often considered one of the biggest flops of the dot-com bubble. More recently, Amazon.com invested $175 million in LivingSocial to enter the daily deal business. While LivingSocial still exists today, the outcome for Amazon.com was not much better than Pets.com given that the company wrote off almost its entire investment in LivingSocial in late 2012. Each time Amazon.com expands its e-commerce empire, there's the risk of failure. Management has taken years to fine tune the AmazonFresh grocery delivery concept to avoid a repeat of the fate of Webvan, one of the most notable dot-com failures in history. However, what does it mean to Amazon.com investors if grocery delivery service simply cannot be attractive to consumers relative to brick-and-mortar competitors while also being profitable? While Amazon.com has accumulated significant market share thanks to a great customer experience and disruptive e-commerce business model, it is naive to think that competitors are not devising plans to combat Amazon.com's ongoing growth. Some of these strategies will fail, like Best Buy's price-matching guarantee to combat "showrooming" this holiday season, but others will have success. With hundreds of retailers fighting for market share, there will be plenty of competition. Wal-Mart is a great example; the company is testing same-day delivery including grocery delivery services. If Wal-Mart can effectively match the services offered by Amazon.com, Wal-Mart may have an advantage as e-commerce continues to evolve given its existing scale. Target, grocery stores, pharmacies, and other retailers are also working to find new ways to add the convenience of same-day delivery and in-store pickup of online orders. With significantly higher operating incomes, these companies have the ability to fight back with lower prices as a defense against Amazon.com's ongoing growth. This is particularly true for Wal-Mart, which consistently generates operating income margins above 5% while investing in an e-commerce platform and same-day delivery services that rival those of Amazon.com. Amazon.com has already acknowledged the limitations it faces in its quest to provide unparalleled price, selection, and customer service; the recent announcement of a planned increase in Prime subscription fees from $79 to somewhere in the $99-$119 range means that Amazon.com is starting to feel the squeeze from its low-margin model. 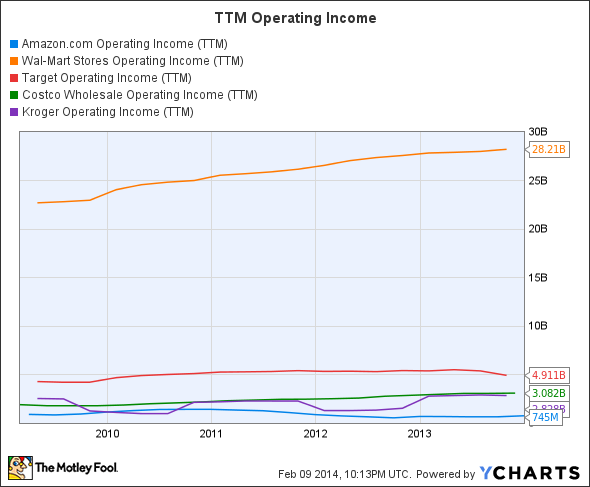 Further pressure from a price war may impair Amazon.com's ability to grow. Is Amazon.com still a buy? There is certainly risk associated with an investment in Amazon.com. A failed expansion into a new market, competition, and lack of flexibility due to lower operating margins are all concerns to monitor. Future evidence that any of these challenges might impact Amazon.com's long-term growth should be very seriously considered in evaluating an investment in the company. However, Amazon.com's core strengths and significant room for growth are unparalleled. Without the baggage of brick-and-mortar store costs, Amazon.com has been able to maintain a high growth rate for years. Until there is strong evidence that a competitor can create a more compelling value proposition for customers in terms of selection, price, fast and free shipping, and overall experience, it is likely that Amazon.com will continue on its growth trajectory. Thanks to a decline in share price following last quarter's growth of "only" 20%, shares of Amazon.com can be purchased at a reasonable price considering the long-term outlook for the company's ongoing growth.